I need the opinion of intelligent, creative people so of course I've come to you. There are two questions rolling around in elementary education right now that I'd love to hear your thoughts about. 1. Do you think kids need to learn cursive nowadays? 2. 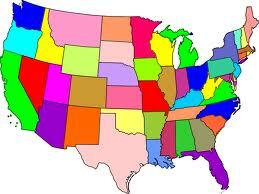 Do you think kids need to learn the 50 U.S. states and capitals? I said two questions, but I'm changing that to four. I can't help it. It's a teacher thing. Please explain the "why" after each answer. I don't want to tell you my thoughts up front. I'll sneak those into the comments. "Hit me with your best shot. Fire away." Hello new followers. Thanks for comin' aboard. Hi Leslie, I am in International Education. I do not feel cursive is essential, but legible handwriting, YES! I am European, I would expect our kids to know the nations and capital cities of Europe. If I was in the US, I would most certainly expect them to know the states and cities. I think knowledge of geographical names and locations in which one lives helps towards an outward focus. I also believe memorization IS still an important part of education. I think our U.S. kids should ALSO know world geography. Here, here with memorization skills. Can you say "multiplication facts?" Love those colorful little states. :) Pretty. Yes, I think both are important to learn. We do still need to write on paper occasionally and cursive is faster. Geography is very important. I've met people (adults) who, for example, thought San Francisco was a state. Maybe I'm a little old school but I think YES on both counts. I don't want cursive to die out. I think it can be beautiful and my seven year old daughter loves it. She is always asking if I'll teach her and for that simple reason I think, yes. My reveal is down below. Old school still rocks. Cursive, not necessarily. Good handwriting, yes. With the increasing presence of computers, people (including adults) are writing less. Even my grocery list gets emailed to myself or typed straight into my phone, and my handwriting is suffering as a result. All 50 states and capitals: definitely. In the UK, kids aren't really taught about geographic awareness, and often people say "I'm not good at geography!" and I sit silently, thinking that it's NOT geography. It's almost common sense to know where places are. Similarly, in my final year of school I was doing group work with this other girl, and she couldn't point to France on a map (and offered the excuse above when she couldn't). I really don't think that's acceptable. I used to be able to name all 50 US states and their capitals, because I taught myself as a kid and felt it was important. I like to know where things are in the world. If someone in New York was invited to a conference in Sacramento, their initial response really can't be "Where's that?" Hi, new follower here. :) I used to be a 5th grade TA, and in my biased opinion, I think both cursive and states/capitals are important. I know cursive is getting less and less attention these days, but as an adult, I'm grateful to know how to nicely sign my name. As for states and capitals... sadly, some of the children I taught didn't even know the difference between our home state and the city they lived in. I think geography is quick to go unnoticed, and I hope that will change. Welcome Shelley. Sadly all of social studies takes a back seat in this day of standardized testing demands in language arts and math. What for? They have video games. :P JUST KIDDING!!!! Yes. I think cursive is still good. Maybe it just makes me feel better and less lost in the newfangled world. Also the states and capitals? Of course! As far as I know we are still living in a country made up of fifty states. I think our kids ought to be aware that Arkansas is one of them. When did they add Arkansas? I need a new map. I think cursive slows their writing down, makes them practice and it all gets neater. So yes, it's not like they're learning so much they don't have time, is it? Doesn't seem to be the case at our school. Although when my son, who gets OT, gets to 3rd grade, I may feel differently. States and capitals--I still know (and can list) all 50--one of my coolest party tricks. So yes! It's not that hard to learn and it's so important to know geography--you really look kind of dumb at times, in life, if you don't. I think that was worth at least a dollar! I say yes to both questions. Cursive is neat and it won't hurt them to learn it. I will teach my own kids if I get the chance one day. And for the states and capitals, that's the very least, if you live in this country right? Plus it makes you look smart if you can name them all. Yes, I think they should learn their states and capitals b/c it's their country. Handwriting - Unless it is going to be taught right then it shouldn't be taught. If they are going to learn it but never asked to write it in, it doesn't help. They don't practice enough to learn the muscle memory. But cursive can be hard to read unless you've learned it. I'd rather the students have real typing lessons instead of the plunk method which so many kids are switching too but which is so less effective. 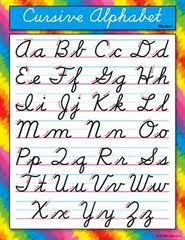 One of my biggest pet peeves is when teachers don't require the kids to practice the cursive they learn in 3rd grade. My classroom rule is, if it's a complete sentence, it has to be in cursive. Oh, and I absolutely agree with Laura...I think typing should be taught early...like in second grade! But I know funds are tight, and that won't happen. Geez--I'm not really sure. About the 50 states, I wouldn't really know. You know I live in Chile, and I barely know like 10 states, lol. And yes--typing is REALLY important now! I think my students should ALSO know where Chile is, along with the rest of South and Central America. Don't get me started on Canada. Wow, I can't imagine why anyone would think kids DON'T need to learn these things. Two definite yes's from me. Yes, to both, but on the cursive, I don't think they need to be brought to tears over it when they ask for all their reports to be on the computer or on flash drives or the school provides lap tops for them to do their work on. I don't think it should be a report card grade, but it's a necessity for communication. I also wish they'd teach typing so kids don't hunt and peck on the keyboard. States and capitals yes and where they are located would be even better! Not quite sure about cursive, honestly. The only time I use it is to sign checks. Absolutely yes on the 50 states, though. That is something every American citizen should know. I'll admit that I think cursive is outdated. With so much technology being so available, the need for handwriting is becoming extinct. But the 50 states and capitals?? YES, yes, yes! I can't say it enough. WE LIVE IN THIS COUNTRY. Everyone should know about it! Yes for cursive. A veteran teacher once told me that note taking and performance on writing tests is done faster when it's in cursive, and I also notice that. Yes on the 50 states. It's history, geography, and the art of memorization in one. 50 states and capitals? I definitely think so. We are going through a state a week, learning the flag, symbols and a little history and geography. The kids love it, and are retaining more than if we did it all in one dose. Hmmm.... Well, I think it is nice when people have good penmanship. That seems to be a dying art. However, I have lousy penmanship and the only cursive I ever use is in signing my name. And I seem to be doing okay. States and capitols? Well, again, it's handy to know - but is it really necessary? STATES AND CAPS - Abso-posi-tiva-lutely. Kids should know the geography of their country as well as the history of how the U.S. came to be. It's a great story. My students are ready if Leno ever comes up to them on the street and asks a states/caps question. CURSIVE - Awesome fine motor skill activity. Kids must be able to read it even if they are taking notes on their laptops. Gotta have that all important cursive signature. MUST HAVE - Competent keyboarding skills. That's how we communicate as a global community. Let's hear it for the home row keys. I've been wondering about the cursive thing a lot. Seems obsolete. Definitely to the geography tho. That stuff will always be useful. I'm stopping back to let you know that I gave you an award on my blog today. Yes on both accounts! Why wouldn't kids need to know the state capitals? That info has come in handy for me, and I'm Canadian! As for cursive, I think the knowledge should be there. Will they use it often? Probably not. But my signature is in cursive. Without it, I'd probably print my name. Absolutely to both. Cursive may be antiquated to some, but oh, what a wonderful expression of individuality. I can't imagine a world where all "writing" is print. Might as well do away with china and eat off white paper plates. How gauche! States and capitals? Of course! That would be just short of not knowing your street address, wouldn't it? Can't imagine citizens of the multicultural world that don't know the states and capitals in their own country. This is minimalist geography. What would you teach if not this? Cursive is not a bad thing to learn just from the standpoint of eye hand coordination and to sign their names. Definitely any citizen of the U.S. or anyone who is going to be living here should know not only states and capitols, but also geography and history of the states, major cities, and main resources and economies. I am amazed how stupid so many people can be in regard to our country. Also while still in elementary school they should learn more about the entire world. U sed to know all capitals for all 50 states. I could probably do it again if my kids quizzed me. Cursive, I suppose. We have to sign our names, right? I'm for learning cursive. As Stephen said, we have to sign our names. Also why not know the captials? It gives us a sense of the states and how our system is organized. When I learned them, I remember the map I studied and that helped me know where those states were in relation to where I lived. I think it also instilled a sense of curiosity about other places and may have cause all this travel itch that I have. Great questions. Oh. I forgot . . . stop in at http://writegame.blogspot.com and play tag with a few people. Okay, states YES but what use is capitols??? See, I'm a geographer, so learning geography is HIGH on my list. But I see no geographic or socio-cultural or any other use for state capitols! I think learning the state's mottos is very much more interesting and useful because there's usually a great story behind the mottos. I can't speak to cursive though, though I'm reading other people's comments to see what they think. After reading your two questions I was intrigued to read all the answers...and am not disappointed! I'm on the fence about cursive. Sometimes I think it's good for discipline; other times I think it's a waste of time. I am on the fence with cursive. I think it makes writing so much faster, but I use a combination of cursive and printing. I think maybe it is something that kids should be exposed to, but not held accountable for... Fascinating questions! I say yes to both. I agree with early comments about memorization skills, as long as kids also learn to think in the application of those facts. My son is in 3rd grade and learning multiplication facts. Without the daily fact practice his teacher requests (basically a fun way to memorize), he wouldn't have done so well on division and fractions, too. Despite computers, I still think cursive is important. What if we ever lose technology (yes, I watch a lot of TV)? And, as a French teacher, I absolutely think our kids need to learn about their place in their world, and the world as a whole. I still use cursive, and it seems to me like a useful thing to know. Especially if you're trying to read someone's else's cursive. And I think all people should know about the country they live in.